Elevated on a hill in Bohol, enveloped by its skies, breeze, and rustling tropical greenery, La Casita de Baclayon is basically the dream house you didn’t know you wanted. This sustainable B&B is owned by an expat family who’ve lived in the Philippines for many years and who actively support the local community. 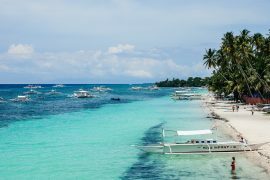 Stay here to be soothed by nature, to appreciate Filipino art and antiques, or simply to recharge on the exquisite island of Bohol. Read my full review of La Casita de Baclayon just below. There’s a sense of harmony, order and attention to detail in every corner of La Casita — from the flower pots lining the courtyard to the cogon grass roof, to the ceramics and cutlery. The cool terracotta tiles come all the way from Vigan, the aged wood tables from Bohol’s ancestral homes, and the textiles from the owners’ travels around the world. The real pleasure of staying at La Casita de Baclayon is in the small moments: a pink pomelo on a lime-green plate, a ray of sunlight spotlighting an embroidered cotton pillow, a show of waving green fronds outside your bedroom window. If you’ve forgotten how good it is to be alive, La Casita will remind you. Baclayon, where La Casita is located, is a 30- to 40-minute drive from the airport in Tagbilaran, Bohol. You can reach Tagbiliaran by boat, by fastcraft from Dumaguete or Cebu, or by direct flight from Manila. The B&B is a little isolated. You won’t, for example, be able to walk out and hail a ride. However La Casita de Baclayon has motorcycles for rent and can organize tours in their own car or arrange a car and driver for you. There are two rooms at La Casita: one in the back of the house with an outdoor shower, and another on the upper floor with a view of the ocean peeping through the trees. Both rooms have spacious balconies, fragrant sheets, Filipino crafts and charming furniture. There are no screens on the windows, so bring some mosquito repellant in case you need it. I really can’t overstate how much I loved staying in La Casita’s rooms. I’m 100% sure you will love it there too. Note: A portion of all the profits from the B&B goes to El Casa Familia, a non-profit organization dedicated to supporting social development and livelihood programs in surrounding communities. The staff all come from the local village. See the bottom of this review for more about La Casita’s sustainable commitments. My advice is to eat in as much as possible! The menu at La Casita de Baclayon is perfect for a short stay. Most of the ingredients are sourced from local producers, so you can look forward to fresh, simple meals that stand out. Everything I ate at La Casita was lovely, but I’m still dreaming of the kitchen’s tomato, olive and basil pasta (recipe, please! ), the beautiful grilled fish, and of course, those divine breakfast spreads. You’d be hard pressed to find a better breakfast in any five-star resort on Bohol. Pretty placemats, delicate bread baskets and fresh flowers are part of every meal. If you’ve never tried Filipino food, check out this list of local dishes you must try while in the Philippines. La Casita can arrange countryside tours, SCUBA diving and even a community tour of the neighborhoods nearby. For beach lovers, La Casita offers an island-hopping tour to Pamilacan Island. Baclayon is the best jump-off point for Pamilacan Island, an unspoiled spot with some wonderful dolphin-watching and snorkeling. Of course, lounging about the house is a legitimate activity on its own. There’s a tempting selection of books and magazines strewn about, and a pack of friendly pups to keep you company. TIP: Make a point to visit the Clarin House, a short drive from La Casita. The atmosphere and antiques inside are worth the stop and nominal entrance fee. La Casita de Baclayon gives guests a culturally rich experience in a beautiful tropical setting. Bohol’s nature and tranquility can be felt throughout the entire house. Fresh, thoughtfully presented meals will be a highlight of your stay, especially the five-star breakfasts. La Casita is off the main road, but well-located if you’re interested in visiting Pamiliacan Island for snorkeling and dolphin-watching. Stay a few nights in this peaceful paradise and you may not want to leave.